are not rarities when you have a collection like mine, but they are good for mental imagery that gets one chuckling. I also broke down and bought an on-demand reprint of The Cluster of Spiritual Songs, Divine Hymns, and Sacred Poems: Being Chiefly a Collection by Jesse Mercer. Not my first or favorite choice, but I haven't been able to come up with one any other way. I was able to make contact with the compiler of Old Time Singing -- Elder Scott Hamilton, an Old Regular Baptist -- but unfortunately discovered the book is out of print and he has no more copies available. A couple days ago I received a copy of a new (2017) hymnal, put out by Religious Affections Ministries in Fort Worth. The editor, Scott Aniol, is a professor at SWBTS. It is not my favorite recent hymnal; it is the most determinedly conservative hymnal I've seen in a long time, and the amount and quality of the really new material is small, but that said, it does contain, here and there, items I have never seen before both new and old, some of which are worth the discovery. I'll be posting a detailed review on my blog sometime soon. If you would like to look at the contents, virtually all the songs are available in PDF, in both full-page and half-page versions, at http://religiousaffections.org/hymns/. We're not in the market for a new church hymnal, but I like the online resource of free, downloadable hymns. I suggested to Scott the possibility of some in shape notes, but that went over like a lead balloon! At the social after yesterday's All-Day Christmas Harp Singing (4th Annual), Marla Elliott and I pulled out a bunch of tunebooks and whatnot to show each other and the onlookers. I was lucky enough to borrow a Daily book (Primitive Baptist Hymn and Tune Book by Elder John Daily) from her (since I can't locate mine), which enabled me to post a mock-up of the text Daily has for ANGEL BAND ("There is a land, a happy land") today. Gospel Gems No. 1 Wolfsohn, 1901; ...wherein is found One Bad Wandered; See! They are Drifting; Be a Good Samaritan...and others. Church Hymnal, 1951; shaped notes only; Tennessee Music and Printing Co.
How's your shelf space looking? There's never a shelf-space shortage a few more hymnals can't cure. We're actually in the process of updating our shelf space, so send 'em on down. Guess you better send me your address again, Haruo. I'm not all that organized. The list is a little confused here, but within each type it reads OK. Impressive. If you are ever inclined to emulate William, you know where to send them, and I will gladly reimburse postage. William Thornton wrote: Gospel Gems No. 1 Wolfsohn, 1901; ...wherein is found One Bad Wandered; See! They are Drifting; Be a Good Samaritan...and others. Received today. Thank Freida profusely for me! Baptist Standard Hymnal with Responsive Readings, 1973 ed., official hymnal of the National Baptist Convention, U.S.A., Inc.
An unusual feature is hymns nos. 678-704, "Supplement—Word Only", followed by 705-728, "Supplement—Familiar Tunes". And there is a prefatory page entitled "Metre—Explained" which if read attentively ought to enable the song leader or requester to make intelligent matches between the two parts of the Supplement. The tune supplement doesn't appear to contain AULD LANG SYNE. For 1973 the selection of hymns appears very elderly, and very "white" for an overwhelmingly black denomination. No "How Great Thou Art", e.g., and no "When Israel Was in Egypt Land", by way of illustration. Oh, I see, even though the copyright notice says 1973, it's identical to their 1924 edition. And it's not as "white" as it looked at first glance. It's got one Charles Price Jones hymn, "Where Shall I Be?" No Tindley that I see so far, though. No spirituals. And (gasp!) all four stanzas of "The Star-Spangled Banner"! The Concordia Hymnal: a Hymnal for Church, School and Home. Rev. 1st word ed. Tarleton Crawford compiled a new hymnal in the Shanghai dialect called Tsán Shîn She (Hymn Book; 讚神詩) and published it in 1855. Leland, have you ever run across this book or a mention of it in your research? Tarleton Perry Crawford was a Baptist missionary in China for roughly the last half of the 19th century. I marvel at the size of your collection Haruo! I don't think so. I wonder whether it was in a romanized script. If it was in characters, I wonder how much it deviated for the Peking (or did they say Peiping?) standard of the day. I have two Chinese hymnals, but neither is that old. In a letter sent to a missionary C. S. Champness, Mrs. Crawford mentioned that there was not a single hymn book in Chinese when they first arrived in Shanghai. With the assistance of his Chinese tutor, Tarleton Crawford compiled a new hymnal in the Shanghai dialect called Tsán Shîn She (Hymn Book; 讚神詩) and published it in 1855. After moving to the Shandong Province in 1863, Crawford transliterated the Shanghai hymns into Mandarin. The Mandarin hymnal was printed in 1870. One of Crawford’s hymn texts appears in the 1973 New Songs of Praise (discussed later in the presentation). “Father in Heaven, Eternal God” was written in 1901 and paired with the tune FOREST by Aaron Chapin. R. H. Graves (1833-1912), a Southern Baptist missionary came to Canton in 1856. For a number of years, he was pastor of the Chinese Baptist Church in Canton. When the South China Mission and the American Baptist Missionary Union established the China Baptist Publication Society in 1899, Graves was selected as the president. If you haven't seen it yet, look at my FB thread on FOREST by Chapin. 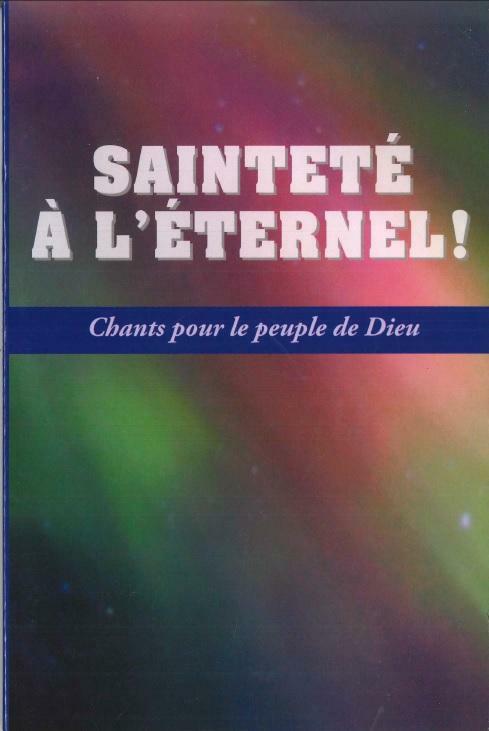 Got an interesting 2005 French-language (though published in Kansas) Nazarene hymnal, Sainteté à l'Éternel!, yesterday.